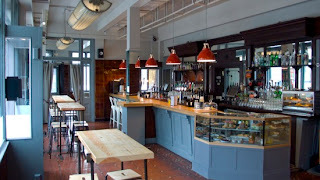 Fluid London blog - musings from the bar and the restaurant table: Is Cool Britannia Making An Olympic Comeback? I don’t know if you’re aware - there’s not been much news coverage, so reasonably speaking you may not be - but there are a couple of low profile events happening in the UK this summer. One is basically a jumped-up sports day, the other is this big, hug-a-grannie type affair; so far, so snooze-worthy. Now, as low-key and subtle as the build-up to these two events has been, there have been a few tell-tale signs for those of you with eagle eyes. Most noticeable has been the silent but potentially deadly inundation of Union Jacks. Shop windows, fashion lines, magazines, and souvenir paraphernalia have all been queuing up to pay homage to the ol’ red, white and blue. Even Stella McCartney has joined in. It seems that, far from being a mid-nineties phenomena, ‘cool Britannia’ is back and means business in 2012. I was surprised last week to discover this even extends to pubs. Recently re-branded and re-opened is The Blacksmith and The Toffeemaker pub on St John Street in Clerkenwell. Named after a song by Jake Thackray (of whom the owners are devout fans), it’s so far, so standard. 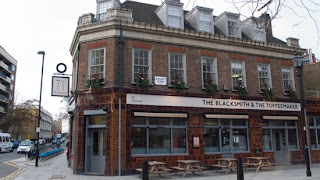 However, The Blacksmith and The Toffeemaker pub is definitely doing its best to hit high on the ‘big‘n’ blighty’ barometer this year. Boasting a bounty of British gins from distilleries across these fair Isles, the drinks list is a happy stroll down a country lane (and potentially into gin-induced inertia). 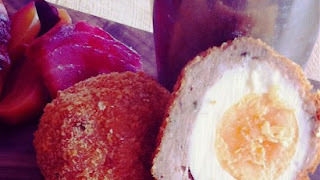 The food is equally Brit-tastic: during our wine tasting event we were treated to native oysters, potted salmon, rabbit pie and that staple of the modern gastropub, the homemade scotch egg. After all, what says British fare better than sausagemeat cuddling a runny boiled egg? Tasty and convincing as the menu was, the only drawback was that, on the Tuesday night upon which I paid my visit, the place lacked atmosphere. Fair-dos, the same could be said of some of the capital’s best drinking holes early in the week. But between the freshly finished décor and the tame mid-week crowd, the vibe (yes, vibe; R Kelly ain’t got nothin’ on me) was a bit, well, flat. The tonic, on the up side, was as fizzy as you’d wish. Still, if you think about it, what did I expect? Add together the slightly apologetic demeanour of the lovely staff and the stiffly polite atmosphere and what could be more British? Go and see for yourself. Just be sure to bring your stiff upper lip in case R Kelly isn’t around.